My initial reaction was disappointment. My personal taste suggests I would be a big fan, but I did not care for the direction or editing. The characters came off as annoying, making it hard to appreciate their cultural infamy. This will probably be a movie I appreciate for its cultural value, and the fact that it challenged censorship, but compared stylistically to a movie like the Godfather that came out only 5 years later, it hasn't aged well. 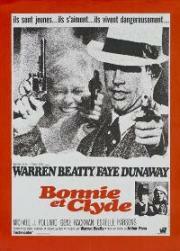 A fun gangster story with an iconic set of lead actors in Dunaway and Beatty. The frank depiction of violence and sexuality must have been radical at the time. For the most part the film still holds up today, only the soundtrack was jarring at times and the character of Blanche almost plays as an offensive cliche now. Forgot to rate. Did not make a huge impression on me. Clyde Barrow: "You know what you done there? You told my story, you told my whole story right there, right there. One time, I told you I was gonna make you somebody. That's what you done for me. You made me somebody they're gonna remember." With some old films it is easy to see the greatness, even if they seem dated. In this case, however, I couldn't see what was so special about it. Wow I can't believe this is the movie that inspired the La La Land/Moonlight Best Picture flub. Iconic. Not a fan of Faye Dunaway's performance here, but the action is top notch.